DONETSK, Ukraine -- When Alexander Zakharchenko, leader of the self-proclaimed Donetsk People’s Republic, declared in recent days that a new state with its capital in rebel territory should replace Ukraine, the idea was quickly ridiculed. 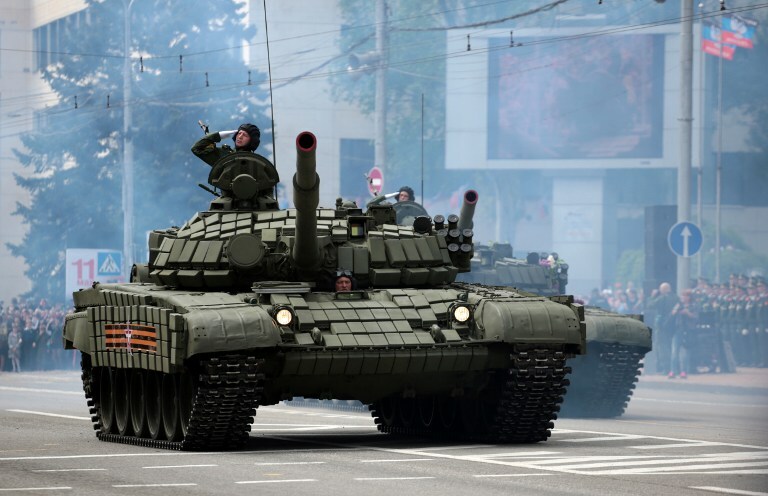 Russian tanks on the streets of Donetsk. Zakharchenko asserted that Ukraine was a failed state and that “Malorossiya” — a historic term used for large parts of modern Ukraine when those were part of the Russian empire — would offer its citizens life in a united country without the war. In Kiev, the statement has been treated as a political provocation. Fellow separatist leaders in the neighbouring self-proclaimed Luhansk People’s Republic distanced themselves. The US government would not dignify the idea with a response. The EU called upon Russia to “distance itself unequivocally from such ‘declarations’”. But the Kremlin is doing just the opposite. “Overall, the whole hype regarding the declaration of the state of Malorossiya is useful,” said Vladislav Surkov, President Vladimir Putin’s point man for Ukraine issues in talks with the US. Surkov’s argument precisely dovetails with a line that Russia’s government has been peddling throughout the conflict in Ukraine. It insists that although Russian volunteer fighters in the Donbass have been recruited in Russian cities, and foreign intelligence and independent research have shown Russian contract fighters as well as regular military units to be involved in the war, Moscow is not a party to the conflict. Alexei Chesnakov, a political consultant and former Kremlin official close to Surkov, says the gist of Surkov’s argument is that the Donbass leaders are not separatists but are fighting for a common country. “They are presenting their vision of the country’s future, which Kiev will have to discuss with them. This underlines that this is a civil war between two parties with differing views of how to develop the country,” he says. Viktor Ukolov, a Ukrainian political analyst known for his pro-presidential commentary, argued that Surkov could be the real author of the Malorossiya concept. The initiative was “the dream of the Kremlin — to portray its own aggression as a civil war . . . in which Zakharchenko not only wants Donbass but has claims for all of the country, thus he is not a separatist, hence it’s a civil war,” Ukolov wrote in a blog post. Others familiar with the Malorossiya initiative also suggest it was born with a little help from Moscow. Chesnakov, who called it a “literary, philosophical catalyst for the political debates we need”, said a group of writers and bloggers presented it to the Donetsk leadership. A person from Zakharchenko’s inner circle said Zakhar Prilepin, a nationalist Russian writer who is a prominent military commander in the Donbass war, took part in a working group that drafted the plans. “When Prilepin proposed this, they thought it was coming from the Kremlin,” said a Russian fighter in Donbass. Prilepin used an interview with Russia’s Komsomolskaya Pravda newspaper to lay out the rationale of the initiative in terms mirroring those used by Surkov. “We will, in fact, cease to be separatists, and they will not be able to call us that name any more because we are supporting a unified state,” he said. Zakharchenko’s Malorossiya suggestion preceded a flare-up in shelling and gunfire by what Ukrainian officials described as “Russian occupying forces” along eastern front lines, claiming the lives of at least nine Ukrainian soldiers this week. The fresh bloodshed added to a death toll exceeding 10,000 since the conflict erupted after Russia’s 2014 Crimea annexation. The Minsk agreements, negotiated with the help of France and Germany, are supposed to help solve the conflict but Moscow has dragged its feet in fulfilling its part. The agreements provide for control over the Ukrainian border in the east to be returned to Kiev but Russia argues this can happen only after the Ukrainian government grants the majority Russian-speaking east of the country far-reaching autonomy rights. Indeed, Moscow succeeded in 2015 in getting a long list of special rights for those regions — such as conducting their own special relations with Russia and establishing their own militias — included in the Minsk agreements. Chesnakov said recent discussions in the Ukrainian parliament on a bill outlining the terms for “re-integration” of the separatist areas had done immense damage because the population in the east perceived the plans as running counter to the promises for more autonomy made in the Minsk agreements. Many outside observers recognise that this set-up, negotiated in 2015 under pressure to stop a bloody flare-up in the war, serves Russia’s goal of preventing Ukraine from becoming a normal state free to choose its future path. “They want Ukraine to be a failed state, so when Zakharchenko says it is a failed state, that’s in fact the Russian position,” said a western diplomat in Moscow. Many diplomats believe Zakharchenko’s push reflects Russia’s wish to demonstrate strength to Kurt Volker, the hawkish new US special representative for Ukraine. For the Russian government, the attempt at rebranding the Donbass insurgents could serve domestic political goals as well. Although Putin is widely expected to win re-election in March next year, fringe nationalists disappointed over his failure to make the separatist regions in eastern Ukraine a part of Russia are among his fiercest critics.